In the past we’ve seen the chocolate pudding fruit. Today, it is the lemonade fruit – A fruit that right off the tree tastes like lemonade. It is a popular tree in New Zealand and Australia, and is also seen growing in some orchards of the USA. However, it is not very commercially popular yet. A lemonade fruit looks a lot like lemon. That is because it is a cross between a navel orange and a lemon, first grown fairly recently, in the 80s. When ripe, it turns yellowish and is nicely segmented inside. Also, they have soft skins and can be peeled with great ease. So it’s easy to eat. 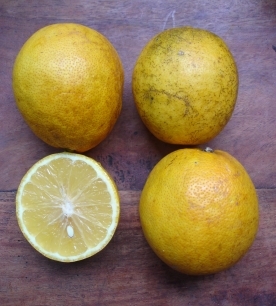 Besides, it has lower acid content gives it a sweet taste, with the flavour of a lemon. It’s never bitter like some lemons. It’s one fruit they say you must try. I can’t wait to try it some time. Like I said, it’s been spotted in the US too. If you are around Santa Monica, California, you could go to the Santa Monica Farmers market to buy some.